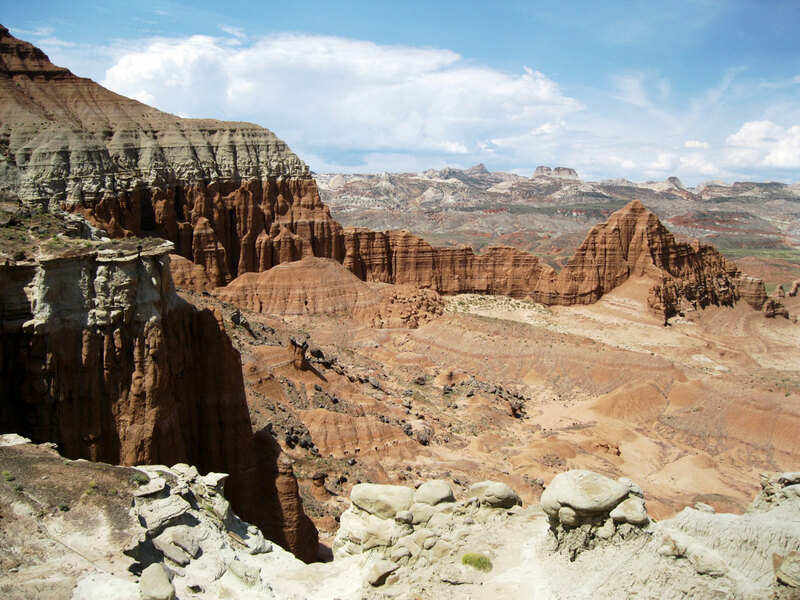 Capitol Reef National Park is one of those places that is tough to get a mental grip on. The variety of rock formations is staggering, each one stranger than the next. Look one direction and you’ll see towering vertical cliffs, look the other and you’ll be staring into a deep canyon and then just a mile ahead there will be an entire landscape tilted at a 45 degree angle. The briefest possible geologic explanation: Sediment was laid down here in layers over millions of years, eventually building up and creating rocks with varying consistencies, textures and colors. Then the whole area underwent uneven uplift, causing the surface to fold into a giant horizontal S-curve. Millions of years of erosion have since worn away the upper layers and shaped the rock into the current landscape. We’re happy we did our research ahead of time, because seeing only what is visible from the park’s scenic drive or from Utah 24 as it passes through the waterpocket fold would have left us with an incomplete picture. That’s what led us to entering the long way via the Burr Trail the previous day. 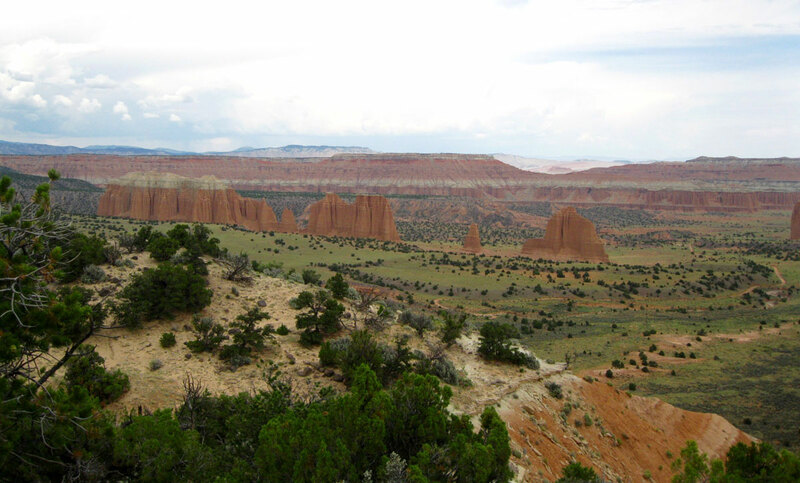 Our reading also pointed us to the northern extremes of Capitol Reef, to an area known as Cathedral Valley, a remote region filled with monoliths, canyons and formations that few dare to visit. The 62-mile Cathedral Valley Loop Road provides backcountry access, but only with the appropriate off-road machine. Enter the folks at Thousand Lakes RV Park who will gladly rent you a Jeep by the day for a reasonable price. We picked up our jacked-up, white 2011 Jeep Wrangler, and armed with a map from the park rangers, exited Highway 24 twelve miles east of the visitor center where we were instructed to ford the Fremont River. When they said “ford a river” we pictured splashing through a gentle stream, but they weren’t kidding. To cross, you enter the 18-inch-deep river, drive along it downstream for about 50 yards and then hang a left and power up the muddy bank on the other side. 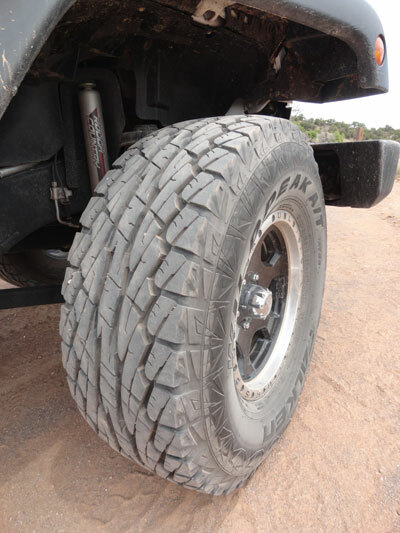 Suddenly the monster truck we were driving didn’t seem like overkill at all. The loop is alternatively soft and sandy or rough and rocky, and it crosses countless steep-sided washes (dry creek beds). In places it can be challenging to navigate for novice off-readers but it’s also a blast to do. Some sections were so rutted and washboarded that we had to slow to a crawl for miles at a time for fear of shaking the Jeep to pieces. Spur roads lead to short hiking trails to panoramic viewpoints at Lower South Desert, Upper South Desert and Upper Cathedral Valley. At about the halfway point there is a campground where we stopped to have our picnic lunch. Being a campground, we expected to encounter other visitors, but it was completely deserted and we ate our Subway sandwiches with a soundtrack provided by distantly rumbling storm clouds. After the campground, the trail descends from a high ridge to the floor of the Cathedral Valley, where we were dwarfed by towering sandstone monoliths that look like art deco buildings. There we took side visits to Gypsum Sinkhole, where eroding gypsum has created a 200-foot-deep hole, and then to the Temples of the Sun and Moon, two giant rock formations standing alone in a valley. The route emerges back onto Utah 24 at Caineville, five miles east of where we had started in the morning. All in all, the drive took 6.5 hours, which averages to about 12-15 miles per hour. We passed a total of two cars the entire time, including one couple who had no map and were eager to find out where the nearest paved road was (luckily for them, we were only about two minutes from the highway at that point). It’s pretty cool to think that we were maybe two of six people who visited Cathedral Valley that day. We hosed the mud off the Jeep at the Torrey car wash as instructed and picked up the Mazda from its day of rest and promised it no more unpaved roads (we’d prove to be liars). That evening gave us a chance to try the more upscale Rim Rock Restaurant at our lodge. I was served the largest plate of ribs I’ve ever seen and our waitress was as friendly as they come. It reminded us how convenient it is to have on-site dining options when staying in remote locales, saving us an additional drive into town. Cathedral Valley viewed from the Upper Cathedral Valley Overlook. We saved the more-traveled scenic drive section of the park for our final morning in Capitol Reef. The visitor center is in the area of the historic town of Fruita, where pioneer families tended orchards in a peaceful settlement between red cliffs. You can still walk into the orchards and pick fruit if you would like. Continuing on the 8-mile scenic drive along the west side of the waterpocket fold leads to numerous viewpoints and trailheads. 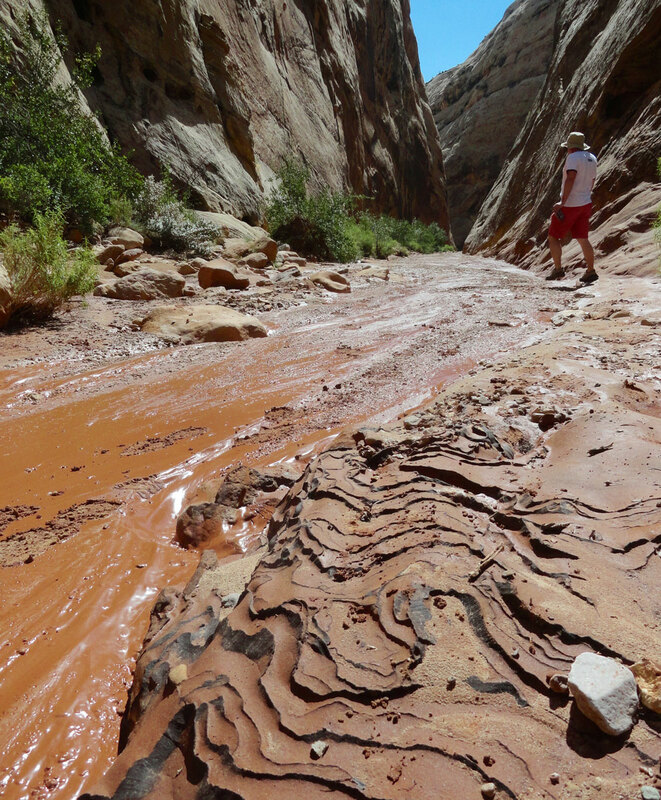 At the end, we took the muddy side road to Capitol Gorge and did a 2.2 mile out-and-back hike through the twisting, narrow canyon. 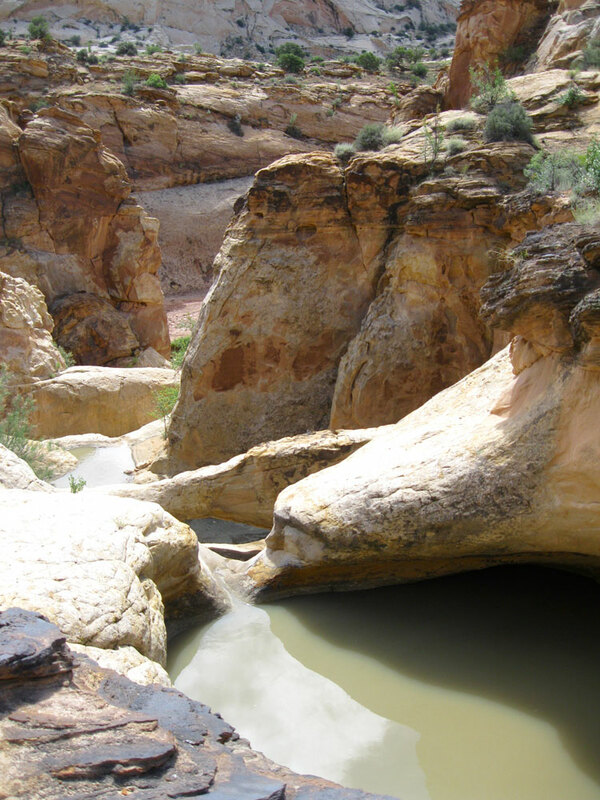 About a mile in, a steep path climbs up the rock wall of the canyon to a series of pools filling bowl-like depressions in the rock. This is the type of formation that gives the name “waterpocket” to this “fold” in the Earth’s crust. Now it all made sense. Waterpockets at the end of the trail. 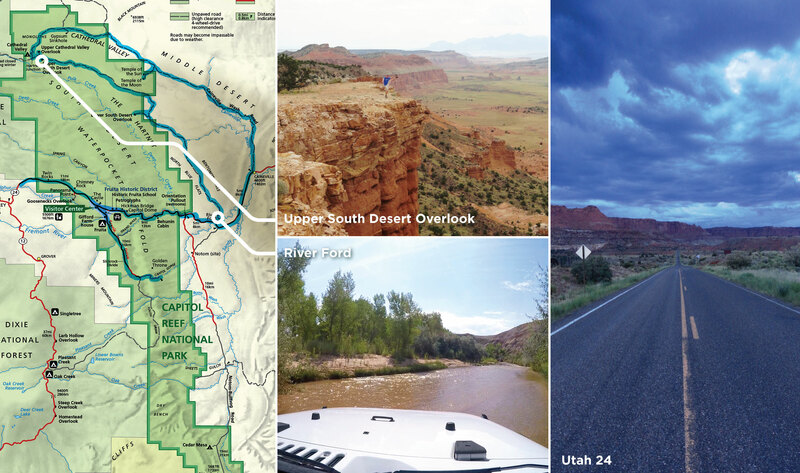 This entry was posted in Destinations, Maps, Travel Tips and tagged Capitol Reef National Park, Cathedral Valley, Jeep Rental, Utah Road Trip, Waterpocket Fold. Bookmark the permalink.